BOSTON - Freshman Courtney Correia, sophomore Kristina Schuler and redshirt junior Sammy Davis all tallied two goals apiece to help lead the No. 8 Boston University women's ice hockey team to a 7-1 victory over Holy Cross on Saturday afternoon at Walter Brown Arena. Holy Cross (1-26-3, 1-22-1 WHEA) took a 1-0 lead 4:04 into the second period, but BU (16-6-7, 13-5-5) finished the period with four goals en route to the win, which extended its nation-long unbeaten streak to 10 games (8-0-2). Correia and Schuler both scored twice in the second stanza while Davis notched both of her goals in the third period. Davis' final marker of the game was her 20thgoal of the season, marking the 10th straight year that a Terrier has tallied 20 goals. Sophomore Jesse Compher also lit the lamp and added her league-leading 34thassist of the season. Freshman Emma Wuthrich recorded a career-high two assists and was one of 14 different Terriers to collect at least one point. Junior Alexandra Calderone notched her first assist of the season while classmates Deziray De Sousa and Breanna Scarpaci each had an assist as well. Seniors Connor Galway, Mary Grace Kelley and Reagan Rust each tallied an assist, as did redshirt junior Abbey Stanley and freshmen Alex Allan and Kaleigh Donnelly. Correia was chosen as the Turnpike Trophy MVP as she scored four goals and added two assists for six points in three games against Holy Cross. BU now holds an 8-1 lead in the 2018-19 edition of the annual all-sport competition between the two schools. - Holy Cross broke a scoreless tie at 4:04 of the second stanza with a power play goal. - Correia responded less than three minutes later to tie the game at 6:54 of the period. - Schuler scored the game-winner just 52 seconds later thanks to some hard work around the net by De Sousa and Kelley. - Then, only 26 seconds later, Correia made it 3-1. Donnelly's pass from the defensive zone hit Correia in stride at the Crusader blue line before Correia deked Julia Pelletier (36 saves) and backhanded the puck into the back of the net. - Schuler extended the lead to 4-1 with only 1:19 remaining in the period. - Davis made it 5-1 at 5:05 of the third frame. Calderone flipped the puck out of the Terrier zone and Davis raced after it before firing it past Pelletier. - BU completed the scoring with a pair of shorthanded goals, the first of which came when Compher scored a long-distance shot into an empty net. Davis then finished the afternoon with her second strike of the game. - Davis recorded her sixth straight multi-point game thanks to her two goals. - She has notched seven goals and eight assists in that span, including nine points (4g, 5a) in the last three tilts. - Compher, who became the first Hockey East skater to reach 50 points, recorded an assist for an NCAA-leading 24th different time this season. - She extended her point streak to 10 games on Saturday, having totaled 18 points (5g, 13a) in that span. - Sophomore Corinne Schroeder made 16 saves. - Calderone, who had missed 56 straight games due to injury over the last two seasons, recorded her first assist since Oct. 15, 2016. 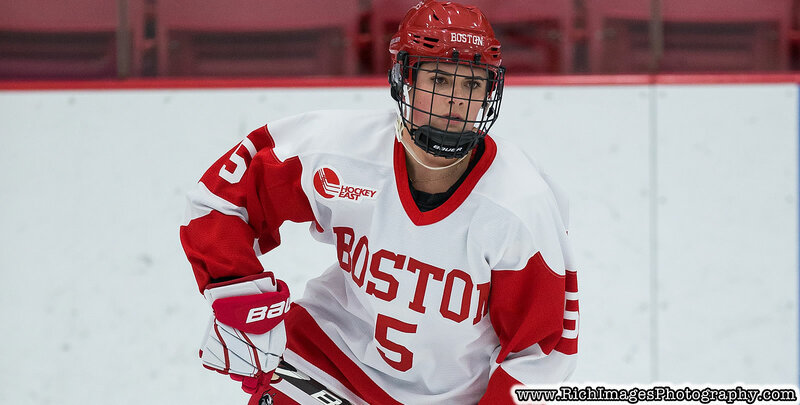 - BU last scored two shorthanded goals in one game on Feb. 27, 2016, when Victoria Bach and Rebecca Leslie achieved that feat in a Hockey East quarterfinal game against Vermont. - The Terriers will now turn their attention to the 41st Women's Beanpot title game on Tuesday night at Harvard. - BU will face off against the host Crimson at 8 p.m.